You can make ordering checks online very simple and easy. You will need to find a voided check or the last check you plan to use from your previous order. If you have a brand new account and have never ordered checks, then you will need to have get information directly from your bank or from any blank checks they may have given you to use before your new checks arrive. You need to find 3 numbers. Routing numbers are identified with your particular bank in the location that you opened your checking account. This is one of the most critical pieces of information for all check orders. The wrong number will give you a lot of grief and will have to be corrected as soon as it is discovered. Be extra careful to get this number right. Account numbers need to be exactly right. Take extra time finding this number. Generally you can get these numbers from your last book of checks or from your deposit slips. This number helps identify your bank account. Check numbers are determined by looking at the last check in your previous check order. For accounting purposes, it will be easier if you keep these numbers in a sequence. If you are just opening an account, you can pick any number you want. If you don't have access to the last number of your last check, you can also pick another number, but logically it would be best if you kept things in sequence. 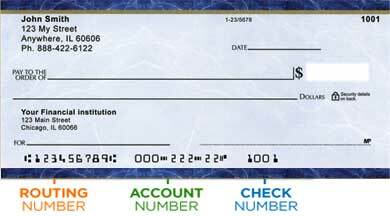 Your Personal Information like your name, street address, city, state and zip code should be printed on your checks. Sometimes there are more than 3 lines of text and in that case, you can use some additional words. You may add a website address, a tag line or an email address. Choose the details you are comfortable giving to your payees. At Coolchecks.net you will just choose your favorite check and click on it. You will then be taken to a third party website that will print the checks and mail them to you. They will collect your personal information. Companies we have partnered with are Carousel Checks, Checks Superstore, 4Checks, Checks Unlimited, Deluxe Checks, Bradford Exchange Checks, Check Advantage and Checks In The Mail. Your ordering information is taken there. No personal information is taken by Coolchecks.net. Please look for a confirmation email shortly after you order your checks. Sometimes people will find these emails in a junk folder or in a spam folder. There are so many different filters that email programs use. Usually if you haven't received a confirmation email, you will find they have been filtered to a place other than your main inbox. Checks will arrive in the mail. Be sure to look at your confirmation email if you want to track your order to determine when your checks will arrive.